What Sleep Disorders Occur After Traumatic Brain Injury? There are a variety of sleep disorders that occur after a traumatic brain injury (TBI). Sleep dysfunction is a very common symptom after TBI. The Centers for Disease Control (CDC) deem it so important that it is a primary symptom cluster for epidemiologic studies. These include sleep quantity issues of either insomnia or hypersomnia. There can also be sleep quality issues, such as sleep disordered breathing or parasomnias, as well as sleep timing issues associated with circadian dysfunction. One of the recent and interesting paradigms is to consider sleep as not only a symptom or sequelae of brain injury but also as a process that plays a role in recovery after TBI. Which Sleep Disorders Are More Likely? An interesting thing about people with TBI is that the symptoms, particularly sleep, can evolve. It is not uncommon for people with TBI to express that in the first 1 to 2 weeks after injury they were sleeping a lot, only to have that change to become difficulty falling asleep or insomnia. The issue of insomnia is very common and moreso after mild TBI (mTBI), also known as concussion, than after moderate-to-severe TBI. After mTBI, if hypersomnia persists, we tend to look for other underlying and perhaps preexisting sleep disorders or other problems, such as sleep-disordered breathing, circadian delay syndrome, or anxiety. In contrast, persistent hypersomnia is well reported after a moderate-to-severe TBI. It is hypothesized that this may be related to damage to the neuroendocrine system or hypothalamus from the TBI itself, creating a biologic driver of hypersomnia. Risk factors for this include injury severe enough to have been in a coma for 24 hours or more, have required neurosurgery, or have an associated skull fracture with potential injury to the posterior hypothalamus. In this situation, it is almost as if the injury creates a traumatic dysfunction of hypocretin release that is similar to what we see as an endocrine deficiency in people with idiopathic narcolepsy. Does a Mechanism of Injury Correlate With Specific Sleep Disorders? In a way this is true. Those with concussion tend toward insomnia and this may be related to the mechanism of concussion, thought to be axonal shear force, which would cause a more diffuse injury. Whereas, a more moderate-to-severe brain injury from blunt trauma might have a focal hemorrhage or focal deficit. People with moderate-to-severe TBI don’t report insomnia as much. Some have hypothesized that this may be due to an awareness issue; that is, people may be less aware after a moderate-to-severe injury, whereas after concussion they may be hyperaware and so less likely to sleep. This observation raises the issue of comorbid conditions in people with TBI. Some may have had a sleep disorder that was worsened by an injury. Others may have conditions that resulted from the trauma that interfere with sleep. Additionally, the medications used to treat trauma may also interact with and disrupt sleep. Headache or pain syndromes can disrupt sleep as can psychiatric disorders that may have been pre-existing, worsened by the injury, or secondary to the injury. The varieties of causes can make recognizing and treating sleep problems after TBI more difficult. Are People With Sleep Disorders More Prone to Traumatic Brain Injury? We know that sleep disorders can be a risk for individuals to have motor vehicle accidents, which are the most common cause of TBI. We also know that, in individuals participating in athletics, performance can be decreased by sleep problems making them more likely to sustain injuries, including TBI. Having untreated sleep issues affects performance, which makes people more likely to have injuries. Sleep disorders can worsen prognosis for people when we think about prognosis as “how quickly can we help this individual recover,” because underlying or comorbid sleep problems may worsen sleep dysregulation symptoms or make those harder to treat. Pre-existing conditions such as sleep dysregulation can also confound diagnosis and understanding of a patient’s deficits after TBI, which can prolong time to recovery In addition, considering sleep as an important component of recovery, it is possible that TBI can worsen sleep dysregulation, which, in turn, makes sleep-dependent recovery from TBI take longer. Not only may people with sleep dysregulation be more prone to injury because of performance, depending on the type of sleep disorder, they may also have brain changes that make them more vulnerable to the effects of a brain injury. For example, there are known to be cognitive deficits that occur in people with untreated obstructive sleep apnea and the same circuits and neural networks tend to be damaged in TBI. Chronic insomnia is another good example as brain imaging and other studies suggest that both inflammation and brain atrophy may occur if it is chronic; this would also predispose people to neurodegeneration, potentially making them more vulnerable to TBI. How Long Do Sleep Symptoms of Brain Injury Last? The initial changes that occur in mTBI—for example, sleeping more than usual before developing insomnia—typically are most severe over 1 to 2 weeks and then gradually resolve over 1 to 3 months. In moderate-to-severe injury— for example, those who have pituitary injuries—recovery is typically longer. When sleep symptoms of brain injury last longer than 3 months, the prognosis is more concerning with more long-term issues that need further addressing. For people with mTBI who have insomnia, each patient needs an individual evaluation if symptoms persist. In those who have more difficulty with sleep onset, anxiety tends to be more prevalent; whereas, in those with sleep-maintenance issues, depression appears to be more prevalent. Untreated anxiety and depression put patients with mTBI at higher risk for a slower resolution. How Does Treatment of Sleep Problems in the Context of Brain Injury Differ? For a patient who has had brain injury, I want to understand all the symptoms they have, not just the symptoms related to the sleep-wake cycle and use that as my assessment paradigm. This includes physical symptoms of headache, dizziness, vertigo, and fatigue; cognitive symptoms such as memory or attention difficulties; and emotional symptoms such as depression or anxiety. I also want to understand the sleep issues in great detail: asking whether it is an issue of sleep quantity or quality or a circadian issue. It is important to remember that none of these symptoms occur in isolation, and that each one can affect another, such as sleep deprivation worsening cognitive performance. Management then needs to take into account all of these symptoms and the interactions of symptoms and treatments on each other. So, for example, medications chosen to treat pain need to be those that do not affect sleep or cognition and vice versa. The goal is to find treatments that target the symptoms while also promoting brain recovery. When we think about sleep as something that can be affected by brain injury and that is also necessary for recovery from injury, we think about sleep as a holistic issue that, when treated, can help all other symptoms improve. Could Treating Sleep Issues After Brain Injury Be Part of Treating the Brain Injury? We talk about getting people back to a regular sleep schedule as part of recovery from brain injury. For example, in the past, people were woken every few hours after a brain injury because of concern for brain hemorrhage, and we no longer do that. We understand that getting back to typical sleep is part of both the acute and subacute recovery process. During mTBI, there is sort of a “metabolic storm” in which many substances are released into synapses. We also know that one of the functions of sleep is to clear excess and abnormal proteins from synapses and also to prune or clear synapses after a day of activity, which contributes to neuroplasticity. The need for what is normal clearing of synapses that occurs after a typical day is multiplied after TBI and its metabolic storm. Getting back to a more balanced or homeostatic sleep is part of returning to the typical neuroplasticity. Additionally, there is the recovery of protein homeostasis, such as that of amyloid, which can build up during chronic sleep deprivation because it isn’t cleared by the glymphatic system during sleep. Also, because we know that such buildup of amyloid and other proteins results in cognitive problems in patients with Alzheimer’s disease, we see returning to normal sleep and normal amyloid clearance as part of promoting recovery of cognition after TBI and as part of a comprehensive treatment plan. What Are the Mainstays of Therapy to Return to Healthy Sleep After Brain Injury? We begin by addressing sleep habits and sleep hygiene, including being careful not to overuse electronics and have too much exposure to light just before bedtime. We use cognitive-behavioral techniques when people have difficulty sleeping that isn’t alleviated by good sleep hygiene. When we do use medications to help people return to typical sleep-wake cycles, we use medicines that have less cognitive effect, including trazadone or remelteon (or other melatonin receptor agonists). People might think about using tricyclic antidepressants (TCAs), especially for someone who has headache and insomnia; however, with patients who have had a brain injury, we avoid TCAs because of concern for anticholinergic effects. We also avoid benzodiazepines because of the effects on cognition (Figure). Figure: Returning to Healthy Sleep After Traumatic Brain Injury. There is good evidence that people with TBI can have decreased melatonin release that can lead to circadian rhythm delays. 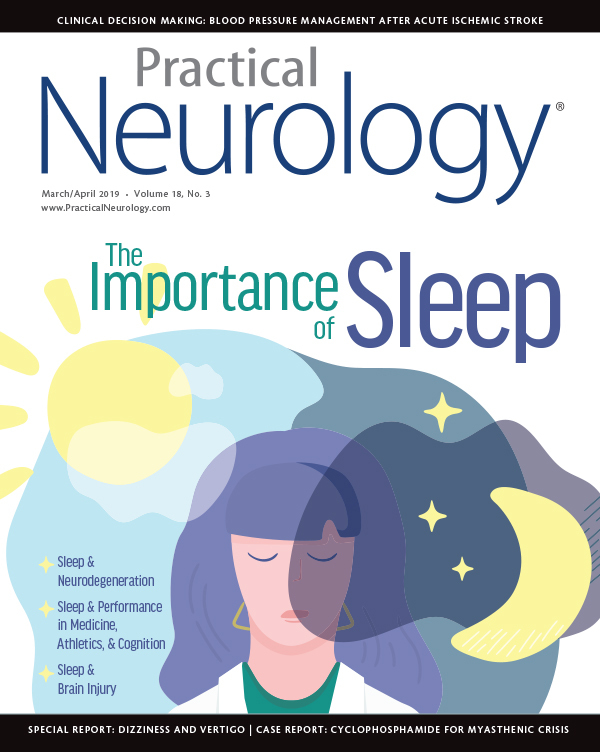 This is particularly important in younger people who experience TBI because they have a naturally delayed circadian rhythm (see Sleep & Neurodevelopment in this issue). It is important to differentiate between that natural occurrence and any disturbance caused by the TBI, especially as delayed circadian rhythm can be misinterpreted as insomnia. How Do You Measure Sleep Recovery? Are There Biomarkers? We wish we had a biomarker for routine clinical use. So far, we are using actigraphy to measure movement as a surrogate marker for sleep, but only in research studies. We have used it to illustrate the importance of sleep in the rehabilitation setting where we measure recovery in comparable populations who have and haven’t had a specific sleep protocol in place. Other investigators have used physiologic measures. Do You See a Correlation Between Sleep Recovery and Overall Recovery? What is starting to become clear is that there are clinical trajectories for different groups of patients with TBIs. For example, for some people, the main driver may be the presence of headache, for others, it may be vestibular or cognitive dysfunction. What we see in people who have sleep difficulties, however, is that their recovery of other TBI or concussion symptoms tends to take longer. So, although we don’t see a correlation in timing of the recovery of sleep with overall recovery, we do see that prolonged recovery of sleep may be an indicator for prolonged recovery from TBI.